Load your soundtrack into iTunes. Create a temporary playlist to work in and then copy your soundtrack into this playlist. Listen to the track and figure out the in (start) and out (stop) points of the just the part you want to convert into a ringtone — make a note of those times. Shady URLs: What’s the upside of being upfront about being shady? We’re all familiar with services which shorten URLs, right? For example this typical short URL http://j.mp/afEzgE links to this article. Some suspect that short URL’s mask links to bad sites — phishing, malware, link poisoning or worse. So what would be the upside of masking an innocent website with a shady URL? Beats me, but here’s how you do it. 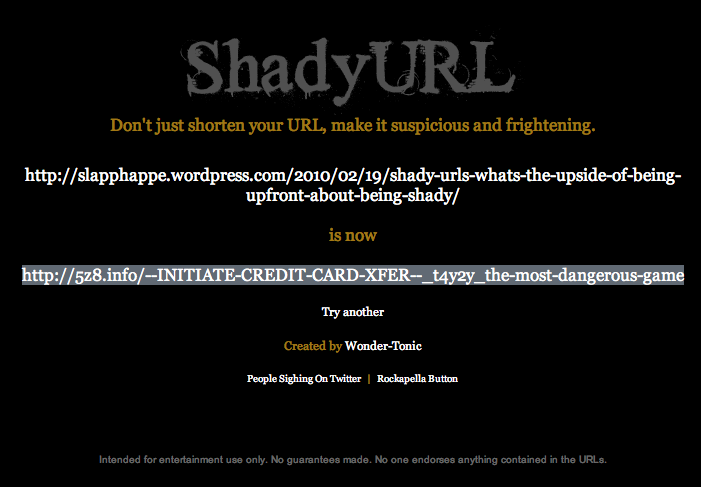 Copy-paste your innocent link into a field at www.shadyurl.com and see it converted into something suspicious like: http://5z8.info/–INITIATE-CREDIT-CARD-XFER–_t4y2y_the-most-dangerous-game. Go on, I dare you to click the link! 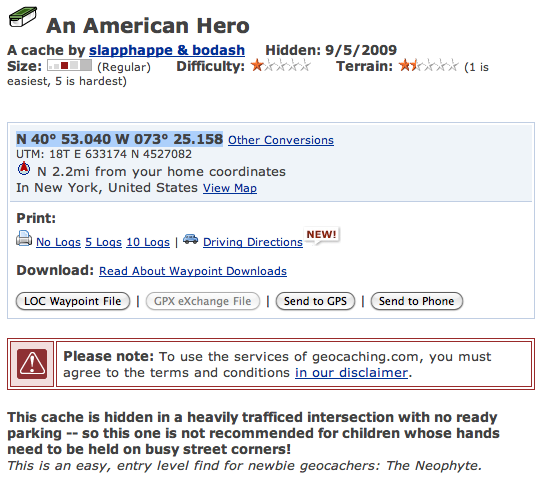 What has an icosahedron got to do with a geocache? 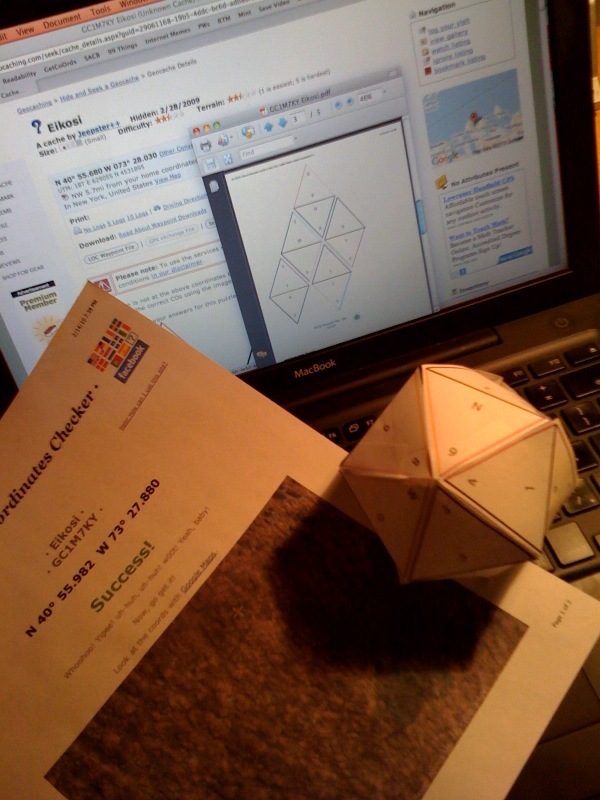 Ummm, what twisted mind has me building an icosahedron just to figure out the coordinates to a cache? GC1M7KY Eikosi — a word which translates to twenty. Safari hangs on launch: What to do about it? If you feel compelled to force quit Safari because it has apparent stopped responding — and then find that it hangs on re-launch — you may try this first: Have a little patience! It may be busy, not hung. 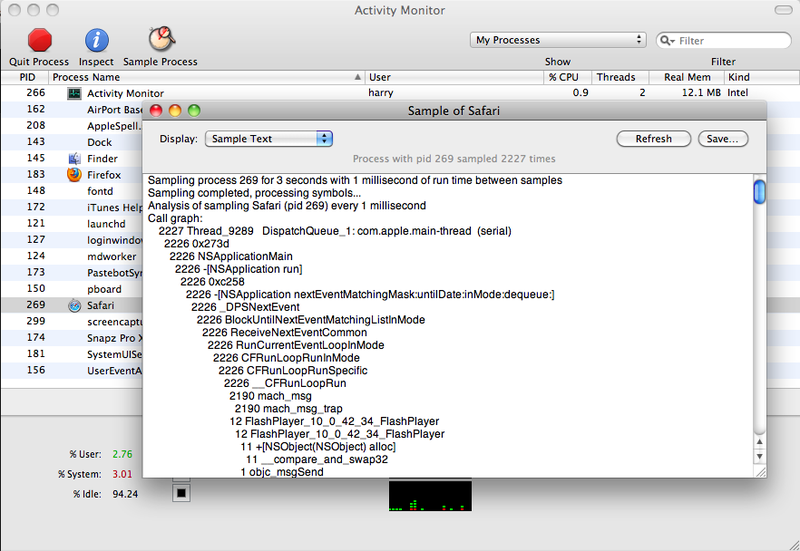 Launch your Activity Monitor application, select Safari and then click on the Sample Process button. A window opens and takes a sample of the app’s activity for a few seconds and presents the results. If it’s doing something, give it a few more minutes. Go make a cup of tea. By the time you get back it may have finished what it needed to do — cleaning up some big mess. Safari eventually launches, or it did in my case. Go>Go to folder… finding /var/folders/ and opening up all the private caches to find the folder com.apple.Safari and deleting its contents or deleting files from Users/~/Library/Safari etc. … perhaps one of these may do it for you. For the record: I’m on an Intel MacBook, under Mac OS X 10.6.2 using Safari 4.0.4. South Africa’s answer to Eminem: Die Antwoord? … when a heap of disenfranchised immaturity is required to understand its appeal: Afrikaans rap, or “zef” as it is called. I blog about it here because it is a watershed in South African culture, for better of for worse, that can’t go unnoticed. Thanks to my brother-in-law Al for the heads up to Die Antwoord. More at tonight.co.za and Die Antwoord. More video Zef Side and Wat Pomp | Die Antwoord’s US debut at Coachella: A Boing Boing Video interview with Xeni. Many of my interests are tied into one another. I enjoy primitive plants, gardening and experimenting. 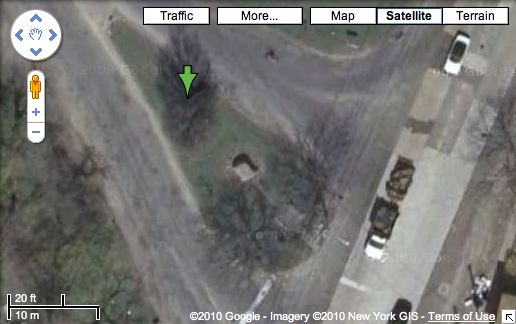 I’m also into urban exploring and now also geocaching — especially graveyards, ruined buildings and parks. What I come across at many of these locations are lichens and moss. So, naturally enough, I’ve taken to collecting samples and growing them in terrariums. 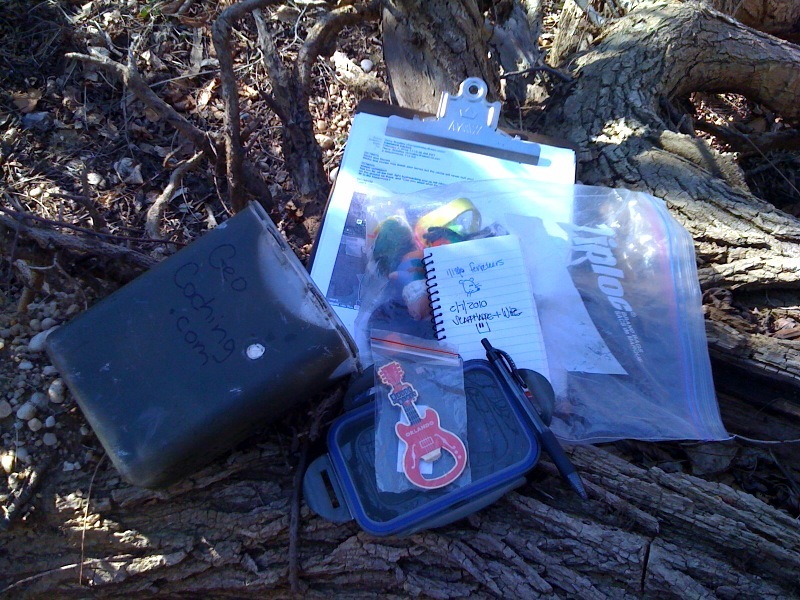 A walk through Caumsett on Lloyds Neck, Long Island yielded two caches, three benchmarks and several samples of moss and lichen — not to mention an enjoyable walk on a brisk but sunny day. I tried a Software Update today, found a couple of items and decided to install them — but on download I got an error message that read “none of the checked updates could be saved” and “you do not have appropriate access privileges”! Focusing on privileges, I figured I must do a Disk Repair on my privileges. No go. What my system was trying to tell me was that folders for these updates already existed in my Library/Updates folder — and that I didn’t have permission to overwrite them. I had to go in and delete these folders manually (my index.plist didn’t have to be deleted). When I ran the updates again it worked. Lesson learned.